At 72, Bob Devlin is chairman of Curragh Capital Partners, a New York-based investment firm that embodies his central values: family and heritage, highlighted by the dual facts of its Irish-inspired name and that the firm’s co-founder is his eldest son Michael. Devlin’s great-grandfather, James, immigrated to the U.S. from Co. Donegal in 1848. Nearly a century later, Bob was born in Brooklyn to Norma Hall Devlin and John M. Devlin, whose career path from a clerk at an insurance firm to CEO of Ter Bush and Powell would provide a model of inspiration and success. After graduating from Tulane University in New Orleans in 1964, Bob entered the life insurance business with Mutual of New York. 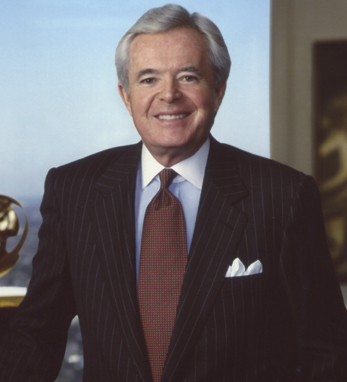 After living in almost every region of the U.S. with numerous companies, in 1995, Devlin was named president and CEO of American General Corporation. One year later, he was made chairman. Under Devlin’s leadership, AGC’s assets more than tripled, and in 2001 the company was acquired by American International Group, Inc. Devlin stepped down after the merger and founded Curragh Capital Partners in October of that year. In addition to helming Curragh, Bob has served on the board of directors of ConocoPhillips, Cooper Industries, LKQ Corp., Discover Financial Services and Forethought Financial Group. Devlin was chairman of the Tulane University’s endowment committee for six years and is a member of the Paul Tulane Society. He was also a trustee of Boston College, from which his sons Michael and Matthew both graduated, and is now a trustee associate. In 2004, he and his wife, Kate, were recognized by the college as Outstanding Parents of the Year. Moreover, Devlin has been involved with numerous philanthropic efforts country-wide, including serving on the boards of the Muscular Dystrophy Chapter in upstate New York, the YMCAs in Sacramento and Nashville, the Houston Fine Arts Museum. A significant number of the Devlins’ philanthropic projects have been connected to his Irish roots as well. He co-chaired the American Irish Historical Society with Liam Neeson and he and his family have supported the restoration of St. Mary’s, a church in Killybegs, and Paul Newman’s Hole in the Wall Gang Camp in Barretstown, Co. Kildare. Bob and Kate are the recipients of many awards, including the Anti-Defamation League’s Torch of Liberty Award and, more recently, he and Kate were inducted into the Joe Torre Safe at Home Foundation Hall of Fame in recognition of their contribution to the fight to end domestic violence. He is also the recipient of one of the Ellis Island Medals of Honor for his business achievements and the AIHS’s Gold Medal. Devlin told Irish America in a 2000 interview for the Business 100 issue that his parents taught him to “have a commitment and a high level of integrity to what you’re going to do and to really stick with it as well as you can.” It is evident this is exactly what he has done.